Due out on November 15 in Japan. Kadokawa Corporation has launched the official Japanese website for the PlayStation 4, Xbox One, and Switch version of RPG Maker MV, which is titled RPG Maker MV Trinity in Japan. RPG Maker is a program that enables the easy creation of original RPGs, born from the desire of users who want to easily make a game, but do not know how to program. Since the graphical and music data necessary to make an RPG are included with the program, anyone with an idea can easily create a game. RPG Maker MV Trinity is a tuning of the original RPG Maker MV released for PC in 2015 to enable easy creation and play on PlayStation 4, Xbox One, and Switch. With RPG Maker MV Trinity, anyone to easily create an original RPG. If you are connected to the Internet, the original RPGs you create can be uploaded and downloaded via the in-game “Maker Plaza” to be played by friends around the world. Also, even users who do not own RPG Maker MV Trinity will be able to download the free RPG Maker MV Player via each platform’s online store to play the original RPGs created in RPG Maker MV Trinity free of charge. Compared to the PC version of RPG Maker MV, RPG Maker MV Trinity has twice the amount of materials, which is a record high for the series. Also, in addition to new materials, character voices and singing music (including background music)—materials not included in previous RPG Maker titles—have also been added. Even users who do not own RPG Maker MV Trinity can download the free RPG Maker MV Player via each platform’s online store to play the original RPGs created in RPG Maker MV Trinity free of charge. 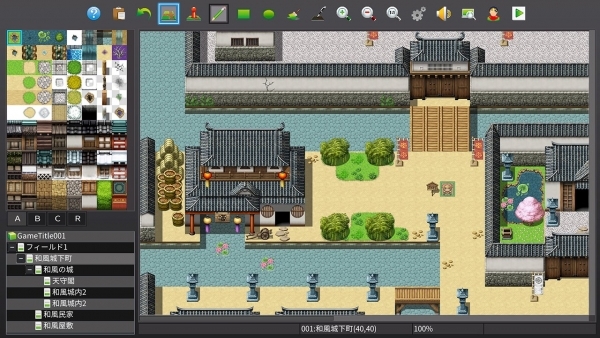 RPG Maker MV Player offers the same functionality as RPG Maker MV Trinity‘s Maker Plaza. From there, players can select the “Download Game” option to download and play their favorite games. Additionally, the games created in the Switch and Xbox One versions of RPG Maker MV Trinity are cross-compatible and can be shared between platforms. Finally, games created and distributed in RPG Maker MV Trinity are shared across the world, meaning you can play games created by users from Japan as well as from other countries. *The Xbox One of RPG Maker MV Player is not called as such. It is instead titled RPG Maker MV Trinity Free Trial Version. *Games cannot be uploaded via RPG Maker MV Player / RPG Maker MV Trinity Free Trial Version. *RPG Maker MV Player / RPG Maker MV Trinity Free Trial Version cannot play games created by the PC version of RPG Maker MV. RPG Maker MV is due out for PlayStation 4, Xbox One, and Switch on November 15 in Japan, and in 2019 in North America and Europe. In Japan, the Xbox One version will be digital-only.